Christine Barksdale is playing some amazing pickleball. She was on medal stand five times during the USAPA’s National Pickleball Tournament earlier this month. Christine has a heart for pickleball, and her positive attitude on the court is contagious. PC: Can you list for us your major wins so we can correctly introduce you to our readers? PC: What paddle do you play with and why? CB: I use a Pro Lite Blaster for outdoor and a Pro Lite Magnum for indoor. When my dad taught me to play, that is what he used so it what I started using and have not changed. PC: What’s your pickleball story? How were you introduced to pickleball? CB: I started playing pickleball for fun in 2009 when my Dad introduced the game to me while I was visiting him at the Voyager RV resort in Tucson, AZ. For the first two years, I only played during my annual visit in AZ. I enjoyed being able to spend time with him. One day, for fun I decided to look into local places to play. That is where I met my early teachers Mike Wolfe, Hunter Duval and Enrique Ruiz. I was extremely fortunate that Enrique called me wanting to play in a tournament. PC: What’s your preference – playing indoor or outdoor? CB: I love outdoor pickleball. While, it is the plexipave surface I love (indoor or outdoor), I also love the outdoor ball and playing in the elements. 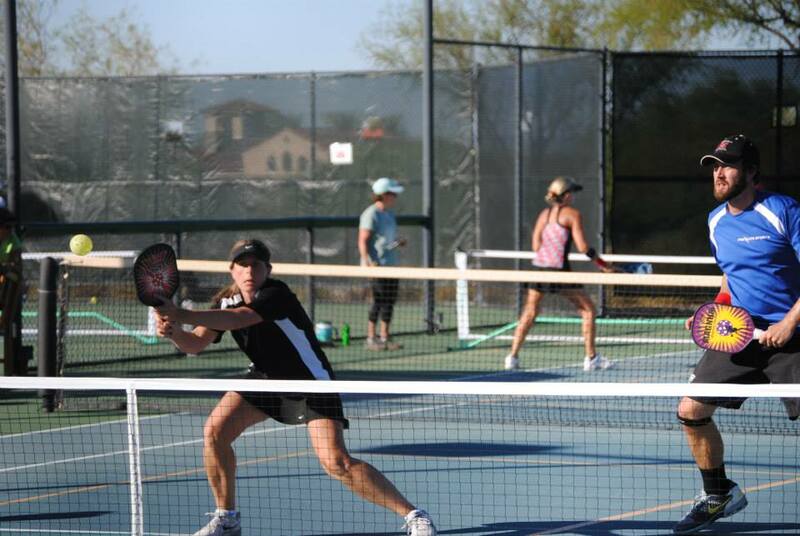 I grew up playing tennis and outdoor pickleball allows me to use the skills I developed as a tennis player. PC: Do you like singles or doubles better? Why? CB: That is a difficult question, I see them as totally different sports. If I was forced to pick, I would pick Doubles. I have been fortunate to have some talented partners. I look forward to 2014/2015 with Joy and Wes, my amazing partners and good friends. PC: What’s your favorite place to play? Why? CB: I love to play any place that has permanent outdoor courts, but would say Brigham, Utah. The courts are designed well and the setting is beautiful! PC: What’s your “secret sauce”? Any tips for players? CB: Practice, Practice, Practice. Grab a bucket of balls, a friend and get out and hit shots over and over. Then, the next time you are out socially playing be sure to implement what you have practiced. Don’t be afraid to lose a game or two while developing a new skill. PC: What’s your day job? CB: Desktop Support for the Vancouver Public Schools, yes, a computer nerd. PC: How many hours a week do you play? How do you make time to play? CB: I generally play once/twice a week. I work pretty long hours so between work, running, tennis and pickleball it’s tough to fit more in. However, I would play more if we had permanent/lighted courts in Vancouver! PC: Any lucky rituals before a big tournament? CB: I don’t have lucky rituals, but I don’t like to mess with luck. I have lucky outfits that I use specifically for tournaments. Also, I never look at the draw. I find out who I am playing when they call my name! I am always amazed at the number of people that know this about me and respectfully don’t discuss the draw in front of me. PC: Do you have any pickleball goals you’d like to share? CB: I have two goals. First, I want to play a generation tournament with my dad. Second, I want to travel to another country to play a tournament and help spread the word that pickleball truly is a sport for a lifetime. PC: Do you mind sharing about your personal life? Are you single? Married? Kids? CB: I am single and have two cats (Mac and Deuce). I have an extremely supportive boyfriend that I have been dating for many years. I love that when I am playing a tourney he is always following the results. He knows the draws better than I do. He loves the software that we use for pickleball, since he can see so many details realtime. PC: Anything else you’d like to share about your experience being one of the best pickleball players in the world? CB: I guess I don’t think of myself as one of the best pickleball players in the world. I think there are lots of folks out there yet to discover the game that will become amazing players! I can tell you that I start getting excited about Nationals, the day Nationals ends the year before. I love the chance to compete but more important, I love the chance to play with and against the top players in the country, then go have dinner with them as my friends. Trying to find videos of Christine playing? Look no longer! i am the Public Works Director in a city in Texas we are in the process of installing Pickleball courts in our city. We are considering the product called Flexcourt. I’m looking for any feedback pro or con on this surface. We generally don’t recommend playing on interlocking foam or plastic courts. Based on what most customers and interested players have told us, pickleballs generally do not bounce well on these surfaces and it can prevent a game from playing out naturally. The safest bet would be to either check with the company to see if their product has been used for pickleball before, or to test a ball on the material directly. Our personal favorite surface to use is PicklePave, and it’s what we used to set up our 4 courts here at PickleballCentral. California Sports Surfaces is the name of the manufacturer and you can give them a call to get suggestions or see if they’re working with any court installation groups in the area. Despite their name, they have a number of different locations they serve. Look,I enjoy the heck out of Pickleball, indoors and out. I’ve now been able to figure out the subtle,yet glaring differences in the in-and-out games, and adjust my play accordingly. One thing remains a constant. Having played a variety of racket sports over the years gives you a unique perspective. I’ve come to realize that since the paddle in this sport is generally slick, it is harder to impart a spin on or gain better control of the ball. The other issue is the ball itself. It’s got an obviously erratic bounce because technically even though it appears round, it has flat spots on it @ the holes. So in normal terms it’s not like any round ball in other sports. Additionally, the materials used to and the process to produce these possibly comes into play….literally! I’ve got my own cures to address these challenges. Thx!